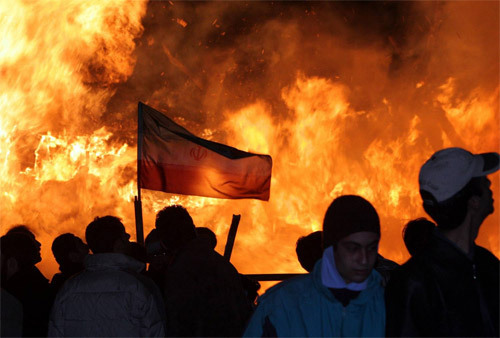 While Iran's national flag flies people gather around a fire during celebrations for the ancient Iranian ceremony of Jashn-eh-Sadeh in Tehran on Monday Jan. 30, 2006. Sadeh is a very important mid-winter celebration observed by Zoroastrians of ancient Persia. Also known as the feast of fire, the deeply religious event is marked by a large bonfire to drive back the winter. Zoroastrianism is an ancient monotheistic religion based on the teachings of Zarathushtra (Zoroaster), who lived in Iran over 2,500 years ago.